Designed by Gae Aulenti for Martinelli Luce, Italy, 1967. This is a real museum quality piece. La Ruspa Quattro is our most expensive and most exclusive lamp. A veritable collectors piece. La Ruspa Quattro features four articulated arms and reflectors. La Ruspa was designed by Italian designer Gae Aulenti for Martinelli Luce in 1967-68. Drawing inspiration from the design of the arm of an excavator, Gae Aulenti created a remarkable sculptural table lamp with a spatial appearance. Uniquely beautiful, the iconic La Ruspa is considered to be a study in futurism and heralded the start of the Italian Space Age design movement which ran between 1968-1972. La Ruspa fulfills that essential criterion of good modern design which is that it is both stylish and functional. It is justifiably regarded as one of the most exceptional icons of Italian design. La Ruspa Quattro has four adjustable, articulated arm body structures in extruded aluminum, lacquered in white. Its swiveling reflectors provide an infinite number of ways to direct the light. La Ruspa provides both direct- and indirect illumination. 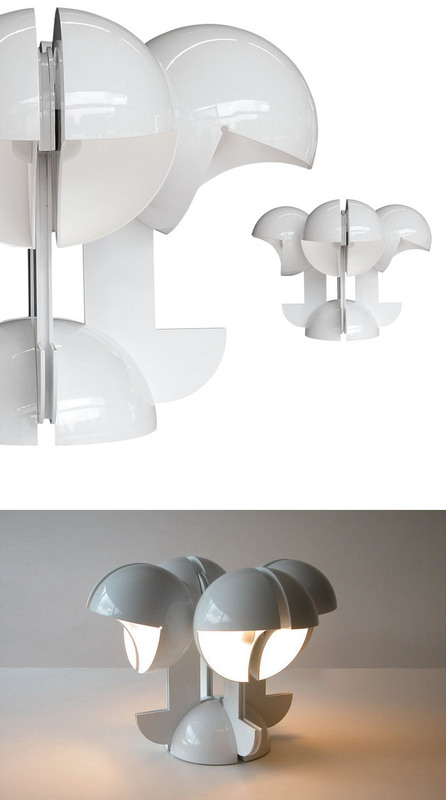 Table lamp with direct and indirect light, swiveling arms and reflectors in aluminum, lacquered white.